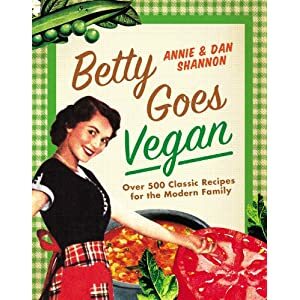 Meet The Shannons: The Family Album : C'est la Vegan's Kim Garr - You Goonie! The Family Album : C'est la Vegan's Kim Garr - You Goonie! If the world of Vegan Food Blogging were to be equated to the 1985 Steven Spielberg Classic The Goonies, C'est La Vegan's Kim Garr would be the lovely, talented*, red-headed and popular cheerleader Andy Carmichael played by the-gal-who-would-make-white-keds-cool Kerri Green. Meet The Shannons would probably be her not so lady-like or cute, socially awkward, glasses-wearing friend Stephanie "Stef" Steinbrenner played by the lovably odd Martha Plimpton. See not only does Kim write the charming masterpiece of a blog C'est La Vegan that has been seen in such mainstream sites as The Kitchn but she also runs her own direct order vegan baking business and a contender in this season of Cupcake Wars! As someone who has spent years and years of my life trying to save animals, I am thrilled to see how mainstream vegan baking has become! This is our time and I know a lot of that is because of talented folks like Kim. We can't wait to make her Coconut Kiwi Cupcake with Vegan Lemon Curd and Fluffy Coconut Frosting and can't recommend the video section on her blog enough. Kim is one of those vegans who was born to be on camera and represents what's classy about cruelty-free living perfectly! OK - No more gabbing about Goonies and cupcakes (we'll be back later with more cupcakes). 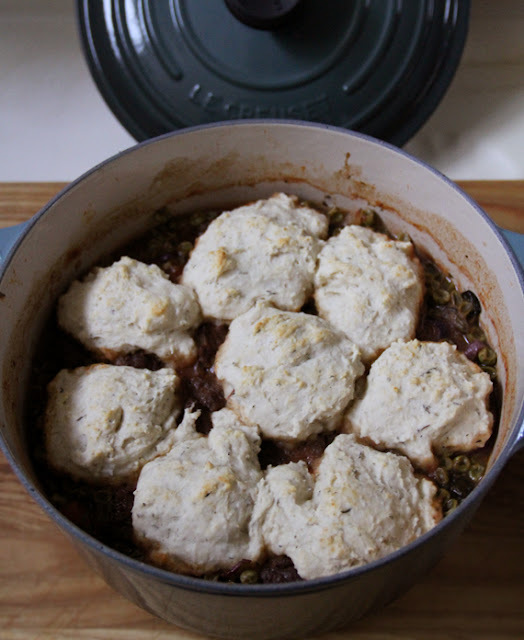 Here's Kim and her take on the Meet The Shannons Beef-Less Burgundy Stew with Herb Dumplings and her seriously gorgeous Le Creuset dutch oven! Ryan and I flew back yesterday, and I took the opportunity last night to use my Christmas present from him – a Le Creuset dutch oven and matching trivet! I’ve wanted one of these for a loooooooooong time. I was always torn about which color I’d want, but when I saw that Williams-Sonoma started carrying the new “ocean” color (which you can’t see that clearly in this photo, but you can see it on the site), I fell in love with it. It was pretty hard to not cook something right when I got it, but it was definitely worth the wait! Ryan’s recovering from a cold that he picked up in the Windy City, and I’m still battling one as well, so I wanted to make some comfort food last night. I thought stew would be perfect and decided to try a recipe that I found last November from Meet The Shannons, an awesome blog that I highly recommend you check out if you aren’t already a reader. This stew was awesome, and I only ended up making a couple changes to the recipe. I used apple cider instead of red wine (we do a detox every January and cut out alcohol), and I had to cook parts of the recipe a little longer than specified. I also sauteed the red onion and celery in the olive oil for a bit before adding the rest of the stew ingredients, partly because I so excited about using my new pot and wanted to do some sauteing in there! I’ll re-post the recipe below with my notes (in brackets) and changes – though they’re very minor. While your Gardein is baking you’ll want to make the rest of your stew. In a large soup pot over medium heat, add the 2 tablespoons of olive oil. Add the diced red onion and celery, and saute until softened. Add the mushrooms and continue to saute. Once they’re released some moisture, add the soy sauce (or Bragg’s), diced tomatoes, wine or cider, veggie broth (with flour whisked in) and spices. Stir well, and add the carrots, parsley, and frozen peas and green beans. Stir occasionally and when it begins to boil cover and reduce heat to a simmer. Continue to check on the Stew and stir occasionally. You will see a brothy liquid form in the bottom of the glass dish you are baking your Gardein in. Pour that Broth into the Stew and stir until mixed in. This is a good time to taste your Stew to see if it needs more Salt or Pepper. You’re going to let your Stew simmer for around 30-40 minutes. You’ll want to remove the pot from heat when the vegetables are tender – especially the Carrots. It is kinda a judgment call on how tender you like your carrots. Some folks like them mushy – some don’t. You are going to also bake this Stew for another 5-8 minutes so keep that in mind when deciding when to remove your Stew from the burner. Once your Stew is ready and vegetables are the desired tenderness, pour the Stew into a large casserole dish or Dutch oven. [I didn't transfer since I cooked everything in the dutch oven to begin with.] Then place the baked Red Onion Slices on top and then make a layer of the Gardein. What you are doing is making a kinda net with the Red Onion to keep the Gardein from sinking or soaking in the Stew. Then with a soup spoon drop spoonfuls of dough on top to make your dumplings. *If you don't know what that scene is - you need to work that out. I think you just made my whole year - I idolized Kerri Green in Goonies! (Loved me some Molly Ringwald too.) Seriously, thank you from the bottom of my heart for your kind words - I love your blog so much, so they mean a lot to me! At what stage does the spinach come in? It's in the ingredients but I don't see it in the instructions. Hi Mark - Sorry about that. Just toss it in with the peas. Let me know what you think if you make this! Hope you like it - it's one of our favorites!